Dogs use their mouth for everything, so having healthy teeth and gums is absolutely essential for them to be the best version of themselves. Yet 4 out of 5 dogs over the age of 3 years suffer from gum disease, which can slow them down as well as lead to vet's treatment. 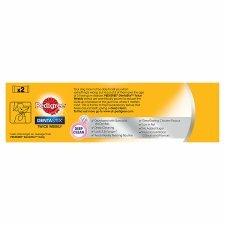 With the help of vets and nutritionists at Waltham™ Centre for Pet Nutrition, Pedigree® has developed a range of tasty dog chews that reduce plaque and tartar build-up, helping to lower the risk of gum disease. 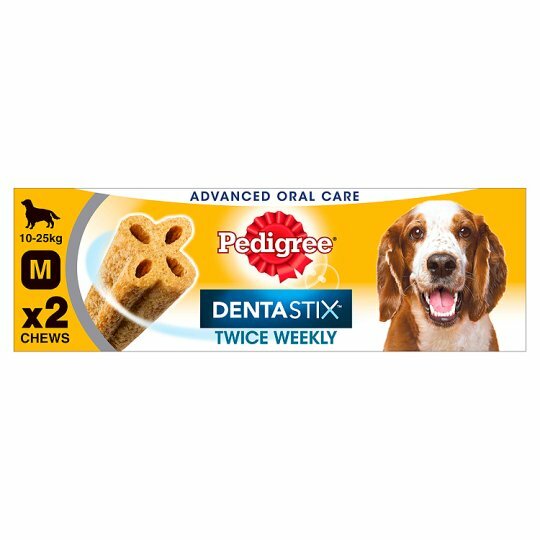 Pedigree® Dentastix Twice Weekly chews are deep-cleaning, longer-lasting dog chews scientifically proven to help to reduce the build-up of plaque at the gum line, where it matters most. This is thanks to their revolutionary texture flexes around the teeth to give a deep clean when fed just twice a week. Feed the good in your dog. Store in a cool and dry place., Best before date: see back of pack. Feeding instructions: Medium dogs, e.g. a Cocker Spaniel, feed 2 chews per week. 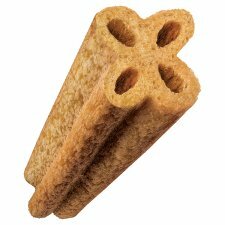 This is a chewy treat that is only suitable for dogs between 10 kg and 25 kg. It is not suitable for young puppies under 4 months. 2 chews provide 13% of the weekly energy requirements of a 10 kg dog. Please reduce main meal accordingly. Use within 24hrs of opening. Fresh drinking water should always be available. Persistent bad breath or bleeding gums can be a sign of gum disease. We recommend a vet. dental check every 6 months, together with an effective oral care routine, to help keep your dog's mouth in good health.